Kamal Hossain says the vote – which took place after deadly clashes – should be declared void. Designer Katherine Hamnett says evidence of mistreatment of factory workers in Dhaka shows the fashion industry is "a stinking business". ITV Exposure investigation uncovers pressures, abuse, violence and safety dangers behind the closed doors of Dhaka's sweatshops. 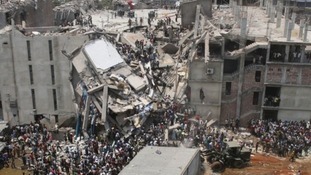 More than 1,100 people werekilled and more than 2,500 injured after the eight-storey Rana Plaza factory building near Dhaka, Bangladesh collapsed on 24th April last year. A government investigation found that poor quality construction materials and building code violations were among the "series of irregularities" that caused the collapse inthe factory which was linked to several high street names in the UK. 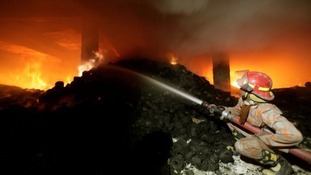 At least 112 people were killed when a fire swept through a garment factory on the outskirts of Bangladesh's capital in November last year. One of the undercover workers filming in a factory in Bangladesh finds that the fire exit on her floor is padlocked. The following morning 'Laboni' finds the door still locked: "Look this is locked. If this factory were to catch fire then will we be able to escape?" This is a particular worry after at least 112 people were killed when a fire swept through the Tazreen garment factory in Dhaka. Secret filming in a factory shows physical and verbal abuse aimed at a young girl. The girl, who says she is 14-years-old is stopped by the shift supervisor from getting water, moments later he yells at the girl for failing to cut all the loose thread from a pair of jeans. Jeans with Lee Cooper labels were seen inside the factory.